Cutloose Climbing: Mushroom Projects Sent! Visiting american climber Zach Levitt spent a day at Redhill and managed to open one of the projects at the Mushroom area. "Wild Wild West" is a two move problem just left of Anarchy. The problem originally received a grade of 7C+, but after a few fast repeats by more climbers, 7B seems to be more accurate. 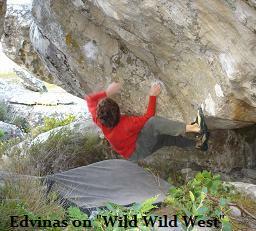 A few meters away, Edvinas Šmigelskis managed to open the long standing sitstart project to "Flaming Pig". This currently makes it one of the hardest problems at the Mushroom area, graded at 7C.